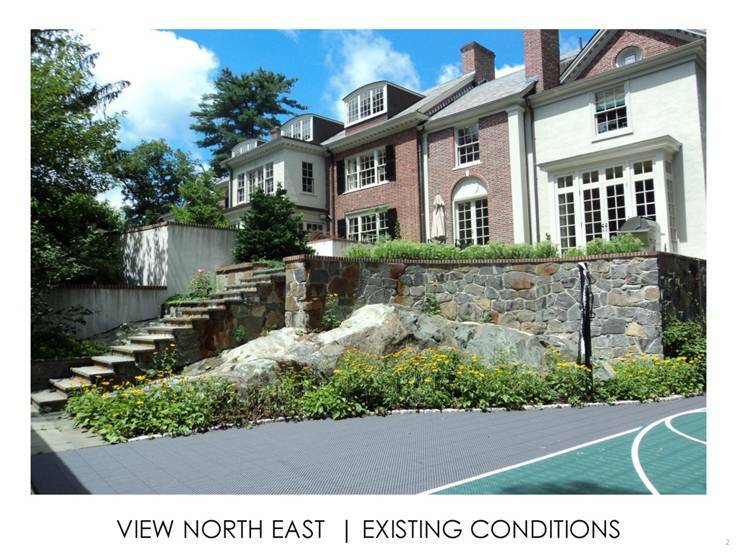 At the “Colony House”, a difficult rocky slope was transformed into a family space that connected a recessed, lower level carriage house with the main house. The steep property and the separation of buildings were transformed through the design into an elegant, dual terraced setting for entertaining and living. 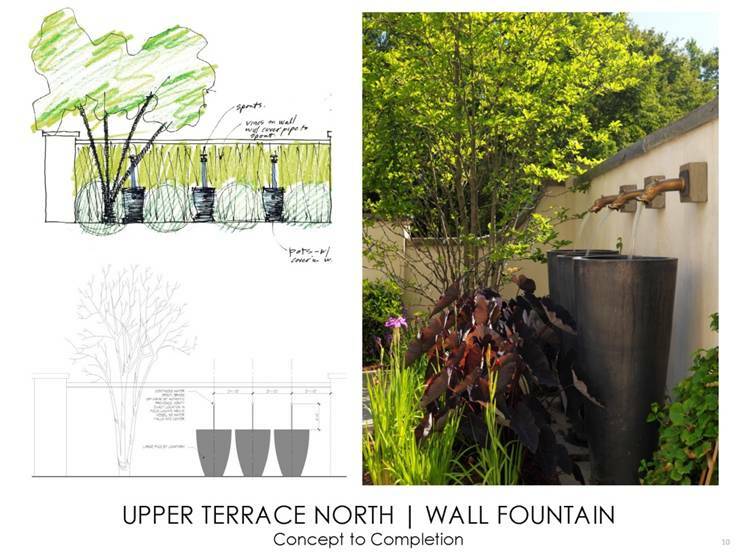 The high level of detail from concept to finished product, with the designer’s artistic vision, created a complete customized landscape transformation. Narrative: Our primary role as a landscape architect was to bring life to a difficult terrain at the clients’ home in Weston, Massachusetts. The house, sited on top of a hill, was separated from the landscape. Exposed ledge outcroppings prevented adequate parking. Residual forest trees were too close to the house and the wooded, hilly terrain left no space for family sports. The duration from master planning through construction completion was eleven months and construction was completed within a 3 month client deadline. The primary purpose of this project was to integrate the main level of the house with the rear of the property, and to re-work the existing landscape to make a connection both physically and visually, to the woods beyond. 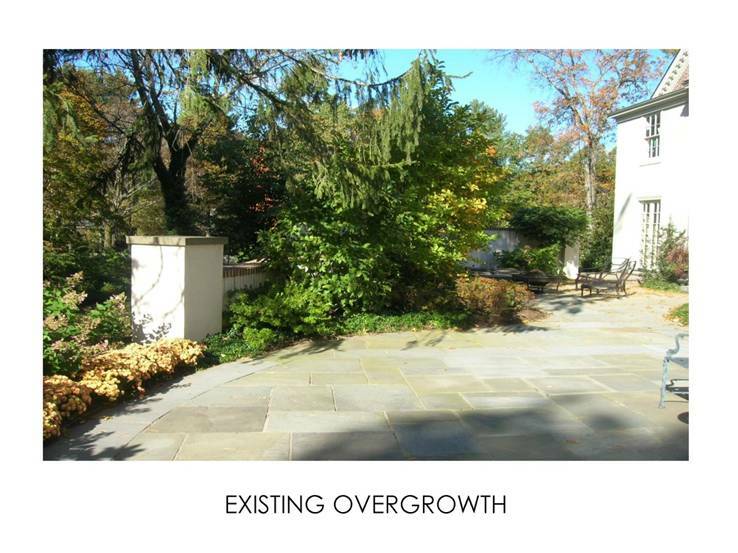 Our vision was to create an elegant landscape as an extension of the classic, colonial revival house. The house and carriage house were completely disconnected and the existing pitch prevented integration between the two. The stone wall of the upper terrace had no connection to any stonework on site. 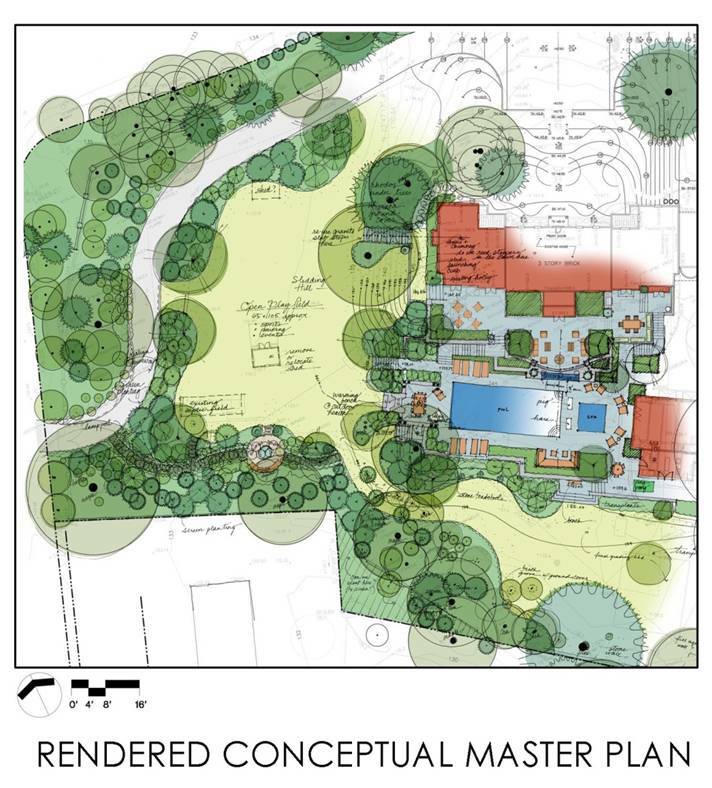 The scope of work addressed in this plan included: planting, grading, drainage, walkways, terraces, retaining walls, fencing, gates, railings, fountains, fireplace, pool, spa, lighting, lawns, and irrigation. Our intent was to provide the clients with more space for entertainment that also functioned as a fun and relaxing environment to share with their four children; and, in collaboration with the owners, to transform the carriage house into a pool house. Our philosophy was to integrate a program for intense sports and entertainment with the natural surroundings, satisfying our clients’ request for a resort-like setting. Our goal was to create, both physically and intrinsically, a procession of experiences uniting the interior design with the exterior. 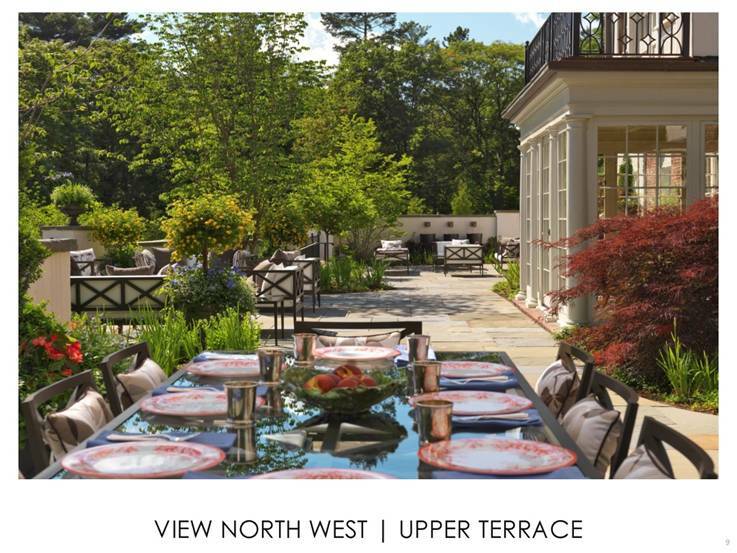 The existing flagstone upper terrace was redesigned to create three distinct exterior “rooms”. New plant beds and large pots with formal standards framed the three spaces, while adding color and reflecting the elegance of the interior décor. 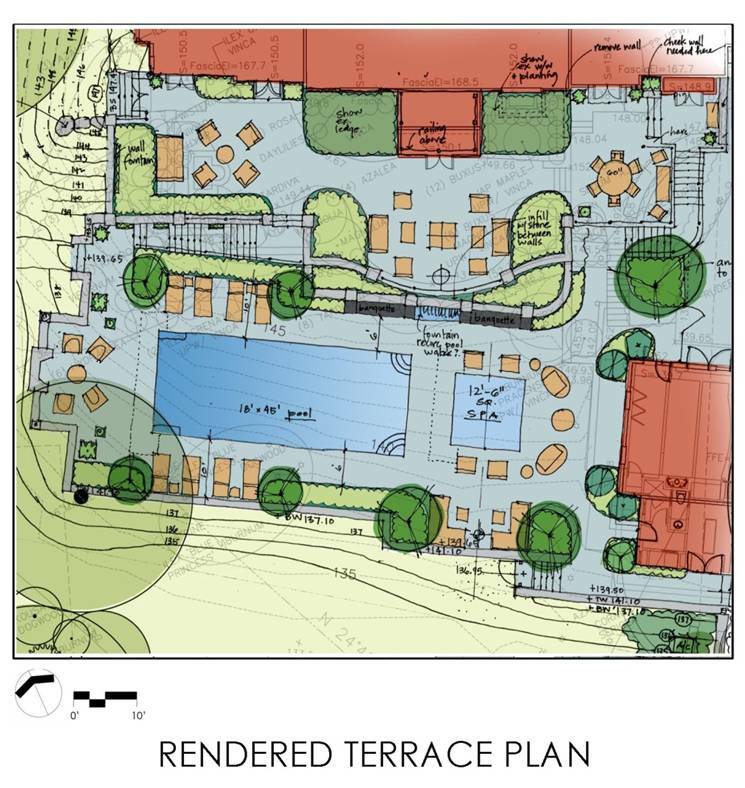 A new lower terrace connected the main house with the carriage house, anchoring the pool, spa and fireplace to the site. 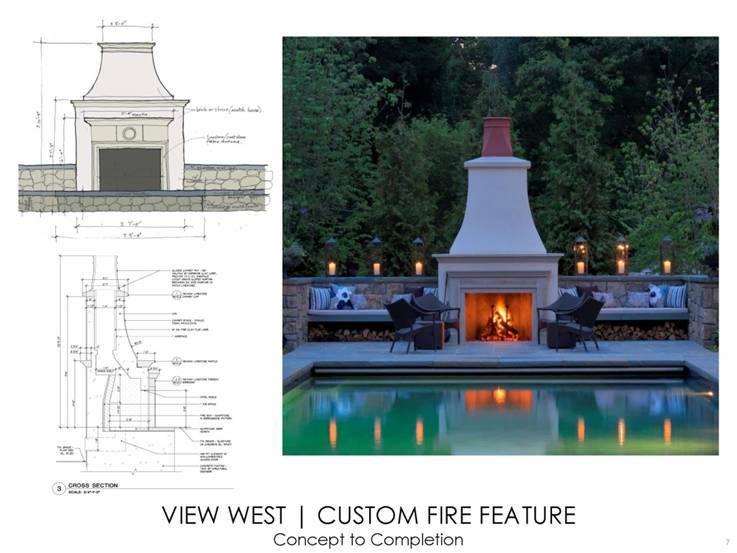 The custom fireplace was positioned so that the firelight reflection in the pool balanced the reflected light from the carriage house into the spa. The focal point of the cross axis is a single block of Jet Mist granite. Its dark vertical line draws the eye back up to the shutters of the house and visually connects the different planes. 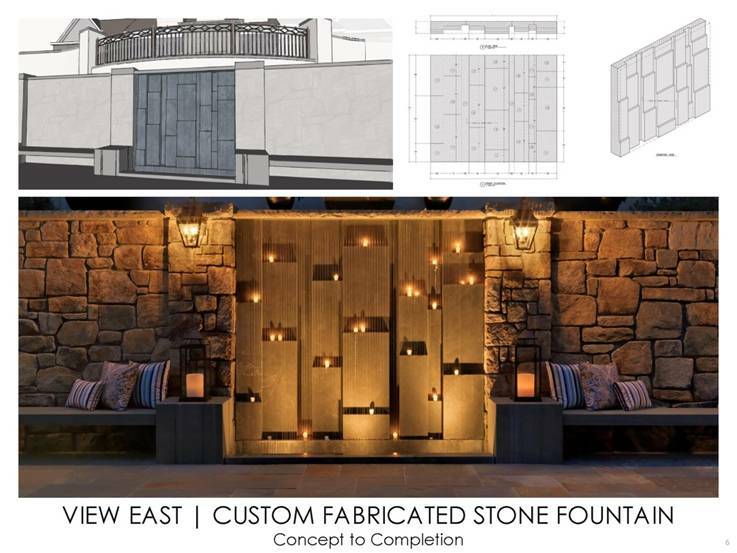 This chiseled granite also served as the backdrop for a custom designed water feature. The stone used in the flanking walls was chosen to match the stonework at the front of the house. The curvilinear design of the woodland restoration connected the terraces to the rest of the landscape. 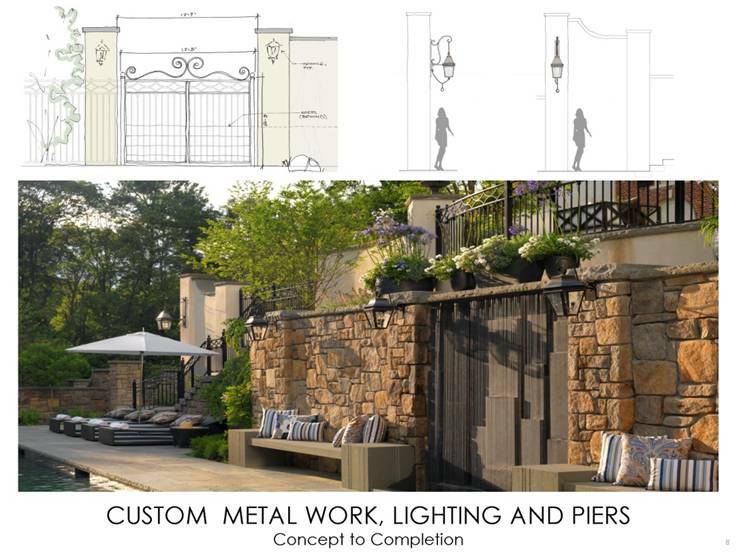 This project had many customized site amenities integrated throughout various areas of the landscape. The entrance gate and railings of the upper terrace were designed to complement the existing rail of the second floor balcony. This design was repeated in all of the fencing on the site. In addition to a customized lantern for the stairs, all of the lanterns in the pool area were refitted to accommodate L.E.D lighting. A new lighting system provided fully automated illumination for security, entertaining, and night time interest. The visible drill lines in the granite bench supports, and the staggered grading differences in the Jet Mist slab, referenced the process of drilling through stone. The custom fireplace reflected the architecture of the fireplaces inside the house. Its flanking stone benches not only provided additional seating, but also a convenient storage area for wood. From the northwest wall of the upper terrace, water flows through a trio of gargoyles into massive stone urns. The sound of falling water provided a soothing ambience to this more private space. By repurposing the large vertical changes, we created a setting complimentary to the formal house and its pastoral surroundings. An additional challenge was to connect the house directly to the lower pool level. In order to minimize site disturbance, we drilled through the granite ledge beneath the dining terrace to create a passageway directly from the house to the pool. This area also served to provide handy storage for pool accessories. The terraced landscape captured and controlled runoff, preventing erosion and degradation of woodlands. The entire existing site landscape was evaluated for health and vigor, and we replenished the site’s forest by planting more trees and native shrubs than were removed. 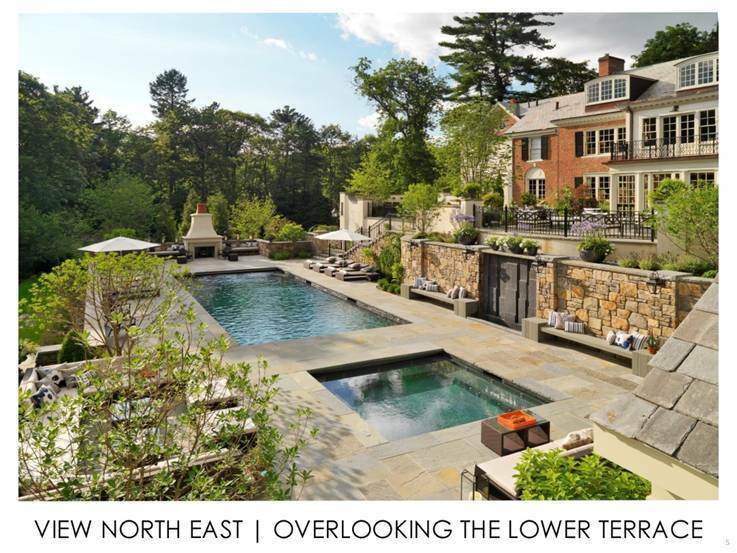 The extraordinary attention to detail in every facet of the design, combined with the designer’s artistic eye, transformed an unusable slope into an outdoor haven for the clients’ family and friends. The landscape architect’s hands-on management of the job, including the selection, procurement and installation of furniture and accessories, brought this project to a successful completion in time for a major family celebration. 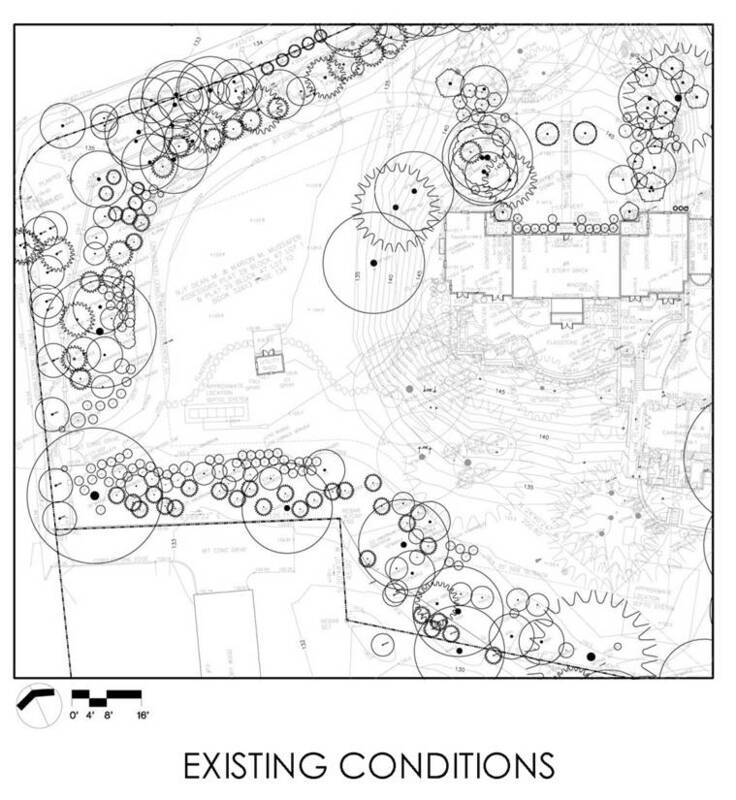 Contractor: Michael Ward, Fields of Dreams, Inc. North Stonington, Ct.